No money to go overseas? 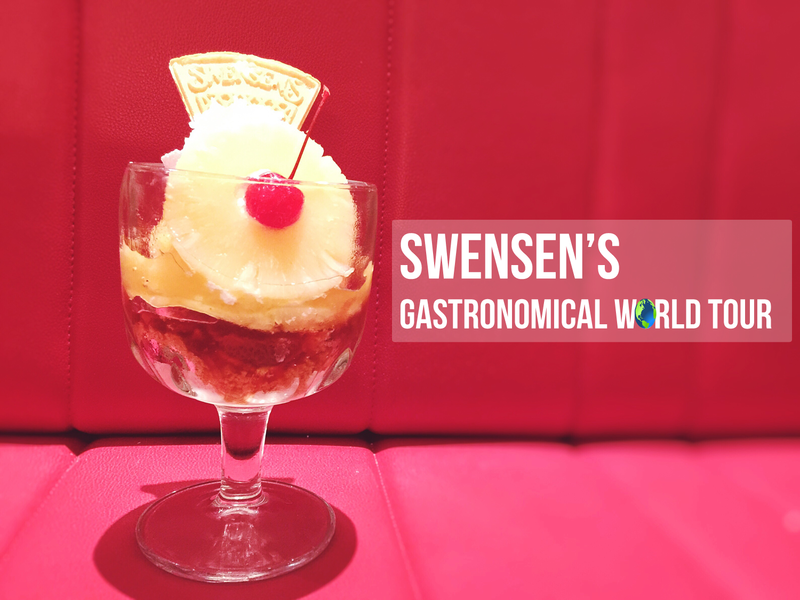 Just go Swensen's for a Gastronomical World Tour! With the proliferation of social media, we are now constantly exposed to new places, new things and new food globally. From that pineapple fried rice in Thailand to Japanese Hambagu, we are always adding new places to our "To-Travel" list. We are now willing to travel to a particular country JUST to have that latest food trend everyone is sharing on Instagram (think Gudetama). THANKFULLY, for 2016, Swensen's will be taking us on a gastronomic journey through monthly new dishes from every continent! Here are the Around the World dish for February and March! Start your gastronomic adventure with this Mad Hatter's Ciabatta Tea Set. At just $5, you can enjoy the signature baked honey buttercream Ciabatta rolls and FREE-FLOW custom roasted coffee! The coffee beans hail from Sumatra Mandheling, Tanzania, El Salvador and Brazillian Robusta, all combined together to produce a coffee blend that boasts a full body finish with hints of earthy notes and caramelized nuts. I thought that the coffee was just okay, but the honey buttercream Ciabatta rolls are pretty good when eaten warm! The Ciabatta Tea Set is only available during weekdays from 2.30pm – 5.00pm only, and they serve alternative free-flow drinks such as tea and soft drinks if you are not a fan of coffee. For the month of February, enjoy an imaginary trip to Thailand with this Pineapple Fried Rice Paradise. Made with a combination of sweet pineapple chunks, cashew fried rice and Wahoo fish fillet, Swensen's wants you have a taste of the Tropics. To be honest, this tasted nothing like the Thai Pineapple fried rice we are familiar with. This was more sweet and less.. intricate. Like its name implies, I felt that this gives people the feeling of enjoying a tan under the beach rather than the exotic feel of Thailand. How can we not have a pineapple dessert for the Chinese New Year? Reassembled with the fillings on top and the sundae below, this upside down sundae is a deconstructed version of a classic American dessert. EAT THIS "ONG LAI" FOR GOOD LUCK! Anyways. INCREDIBLY GOOD STEAK. Imagine grounded beef mixed in with chunky sauteed shiitake mushrooms, grilled to deep brown, then served with a specially concocted Japanese BBQ sauce. SO GOOD. Well, the best things always happens in March, which also happens to be my birthday month. Swensen's Around the World in more than 80 Days Menu launches in Swensen's restaurants islandwide from 1 January 2016 to 31 December 2016. Thank you TouchPR for the invite!